Local art adorns the hardwood forest of birch and poplar outside Dawson City, Yukon Territory. Greetings from the land of the midnight sun!! I've traveled North again and this time I'm writing from an artist's residency at the Klondike Institute of Art in Dawson City, Yukon Territory, CANADA. I'm thrilled to be here. My initial draw to the Yukon was to continue investigating the tally on wild lands in the North as our planet continues to warm up and get crowded. I also want to know what "big wild" really feels like, and to (re)consider the notion of Last Places that I began with in Arctic Greenland. Does undeveloped, non-industrialized land exist in any meaningful context in this world now and what does it look like beyond a remnant of a romantic ideal? I'm happy to say that from my ground level post here in the northwest corner of Canada, the land appears to be doing well. My immediate sense is this: earth as utterly staggering in scope and impossibly vast. I'm aware there's much more to the story than this, but for now I think, take it and run with it. "Thaw" -- Mixed media on tree-free paper by Rebecca Barfoot. There's also a secondary and more personal magnetism that drew me to northern Canada: I've been obsessed with trees since I traveled to Greenland. They've worked their way into my paintings, sculpture, and into my earth-bound, starlit imagination. There are no trees in Greenland - and it occurs to me that perhaps I've fallen in love with absence. 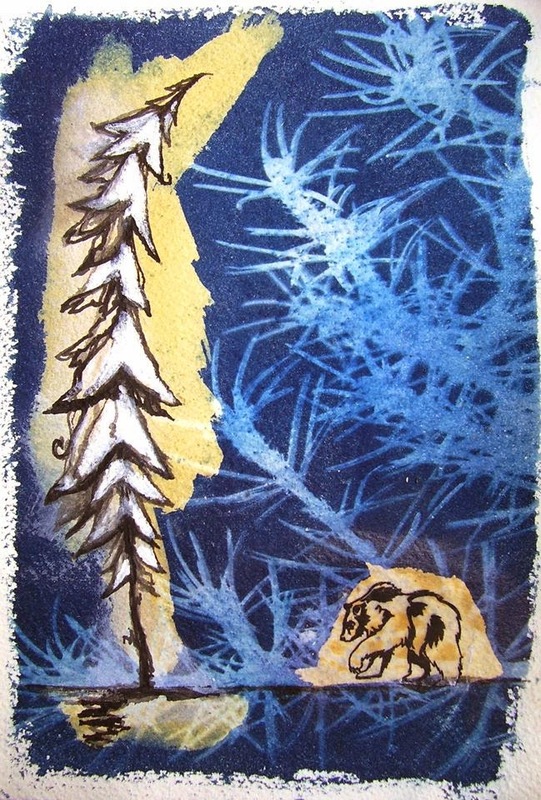 "Mother/Bear Boreal" -- Cyanotype with mixed media by Rebecca Barfoot. 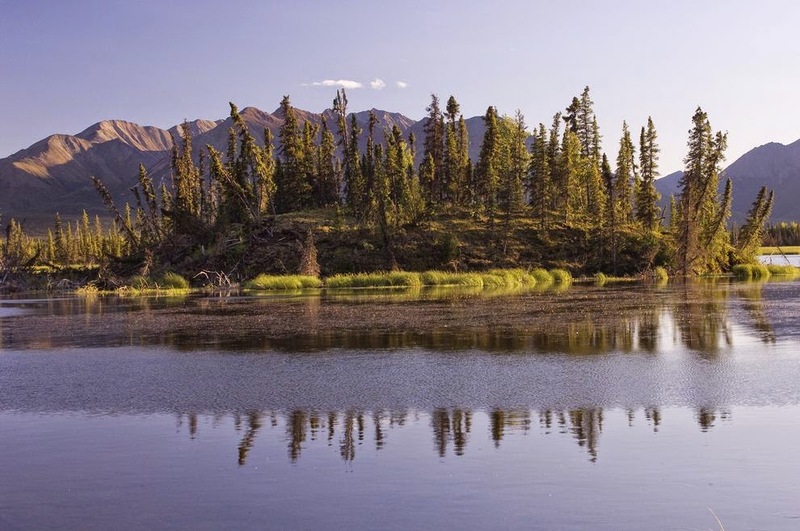 The Yukon is dominated by boreal forest, the largest terrestrial biome on Earth. Known at taiga across Russia, it's the green halo of northern woodland that girdles our globe just south of the Arctic tundra, serving as Earth's "cooler" and regulating temperatures worldwide. Here around Dawson, the boreal consists largely of paper birch, black and white spruce, balsam poplar and aspen. A walk in the woods for me, on a more intimate level, is to feel cradled, sheltered, and supported. One of the more subtle and nuanced interests I have as an artist concerns the internal landscape - both personal and collective - and how it reflects the state of our natural environment. I am beginning to explore the mirroring of inner/outer landscapes in my work. Deep Forest -- Mixed media on tree-free paper by Rebecca Barfoot. Beyond the poetry of trees in form/metaphor is my growing awareness of the biological imperative of the forest in function. Large volumes of boreal woodland are logged for paper pulp (cardboard boxes, magazines, catalogs, paper towels etc), oil and gas extraction (Alberta tar sands...), mining and general money-making. But destroy the forest and you eliminate the planet's most effective method of uptaking (via photosynthesis) and storing atmospheric carbon dioxide (in both living and dead plant matter). 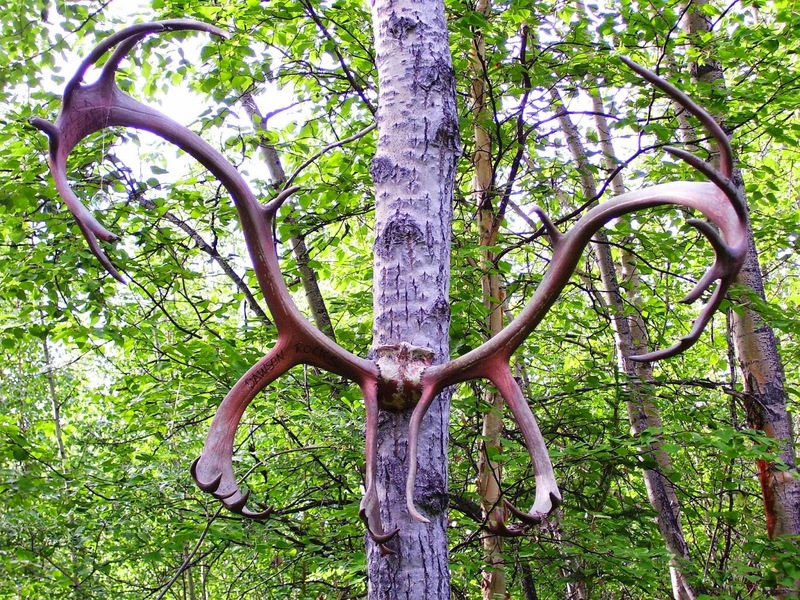 One of the byproducts of our shifting climate is the phenomenon of "drunken" trees in the boreal, tilted and falling as the permafrost thaws beneath them. Earlier this month I noticed stretches of lurching stumbling tumbling black spruce (picea mariana) on the 330 mile stretch of road between Whitehorse and Dawson. It's terribly wrong - and oddly beautiful. "Tilt", Yukon Territory, Canada. 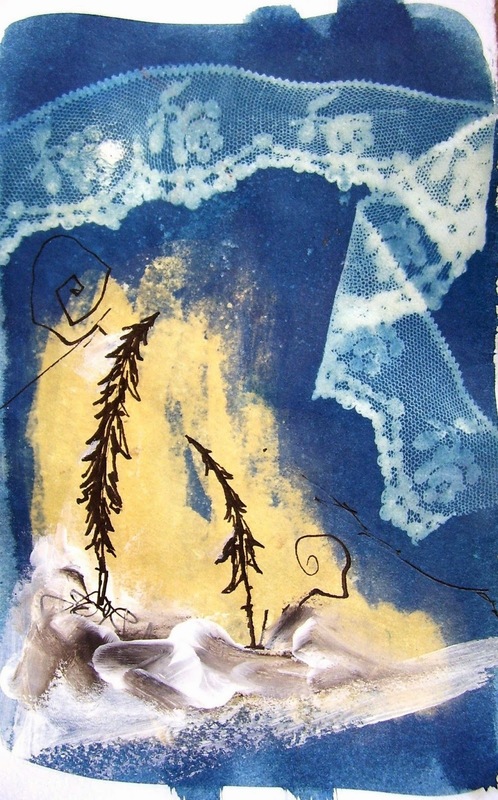 Mixed media on cyanotype by Rebecca Barfoot.